I rarely promote concerts and the likes in my blog but now and then an artist comes along that just deserves a special mention. Declan Bennett is such an artist. Currently playing the role of Guy in the London production of Once he will be presenting his new release “record: BREAKUP” live and acoustic at The Borderline, London on 18th August 2013. Shamelessly “stolen” from his website, here is what others have to say about Declan’s music. I first listened to Declan’s music after seeing him in Once and I can honestly say I agree with all of the above statements. His songs are honest, emotional and real. His voice has a raw quality and draws you into the songs. I urge you to give his music a listen. You can find his albums on iTunes. 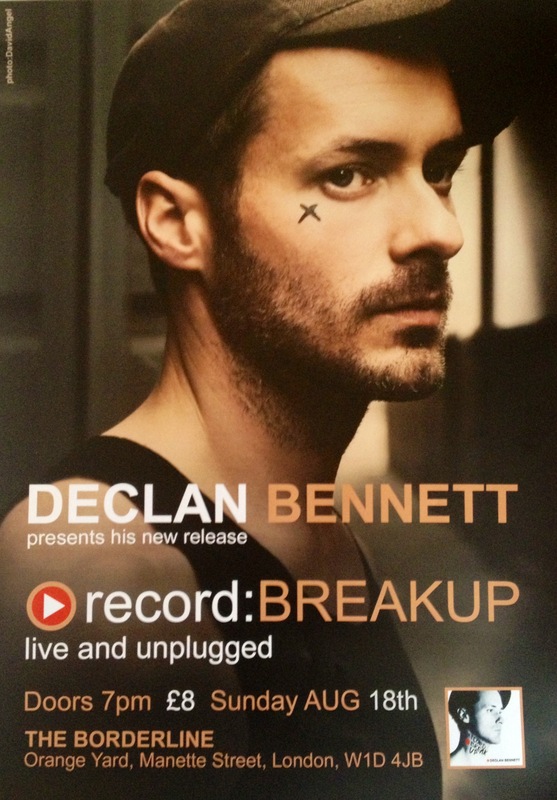 Don’t miss out on Declan’s first gig since his return to the West End. Get your tickets to see him at The Borderline on 18th August here. Find out more about Declan by visiting his website. And follow the man himself on Twitter @thisainttherapy .